Junior high school student Rei Hoshino, a fujoshi who does not especially have any interest in the 3D aspect of life, suddenly changes when on a rainy day she takes interest in a high school student named Kei Akai and wants to get into the same high school as him. To that end, she enlists the help of her childhood friend Shōtarō Kamiyu who helps her study for the entrance examination, and diet so as to become a cuter girl. All goes according to plan, until a scheming girl going to the same school named Luna Kurotsuki makes it harder for Rei to get closer to Kei. 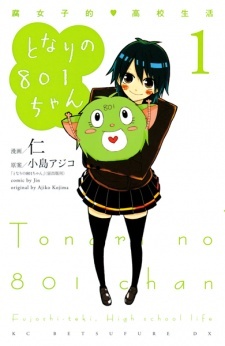 Tonari no 801-chan: Fujoshi-teki♥High School Life is a spin-off based on a webcomic published on Kojima Ajiko's blog.